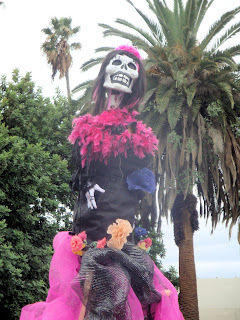 Day of the Dead is an annual Mexican celebration for those who have passed on. It's a celebration of remembrance for families. 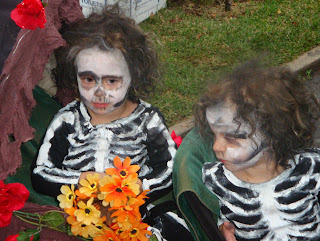 The Mexican culture believe that the spirits return on November 1 and 2 to be reunited with their families. 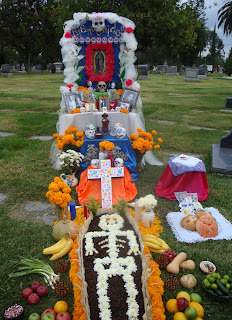 Families decorate their loved one's grave sites with the person's favorite items -- food, fruit, drinks and flowers. Candles are placed by the grave to guide them back safely to the other side. 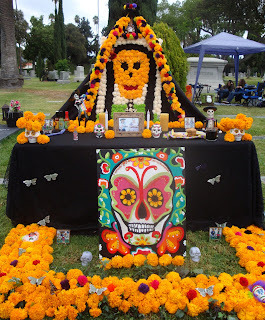 At the Hollywood Forever cemetery this celebration occurs every year and is one of the largest in Los Angeles. Here are a few pictures of the altars that families created for remembrance of their loved ones. 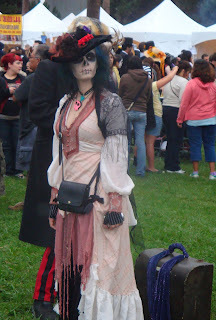 Many people who attend the celebration often dress themselves up as skeletons or the walking dead. Even the children participate. 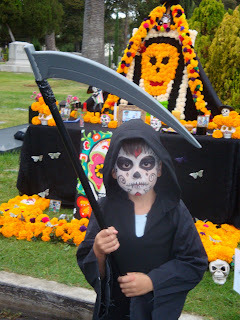 This little boy was in total character as the Grim Reaper. He didn't even crack a smile. And these tiny tots were being pushed in their carriage by their mother. This is their Mother. How would you like to have her watching over your children? Even pets are remembered. 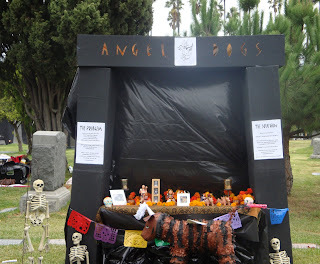 This altar was dedicated to those pups who were put to sleep in Shelters. 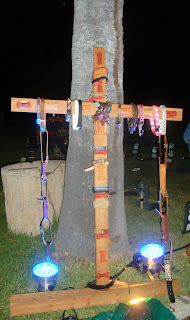 Dog collars are hung on the cross. 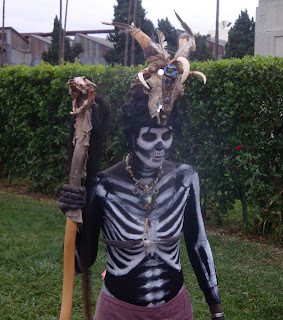 This celebration is not ghoulish or meant to be frightening. 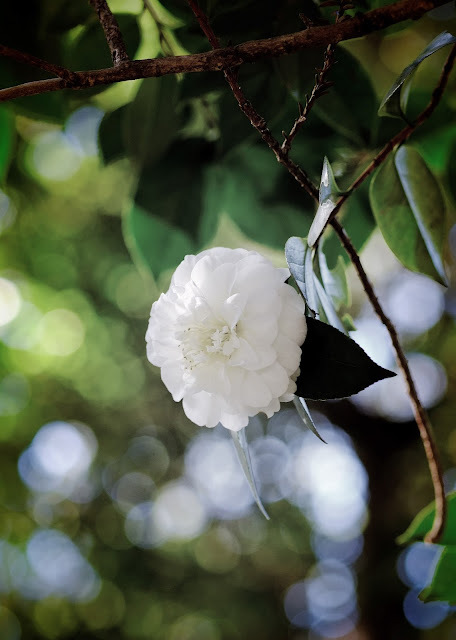 It's more of a celebration of the life that was lived by those who have passed on. It's really quite beautiful. 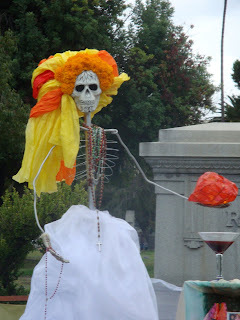 I've never heard of the Dia De Los Muertos. 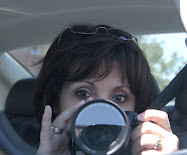 Your pictures are wonderful!! 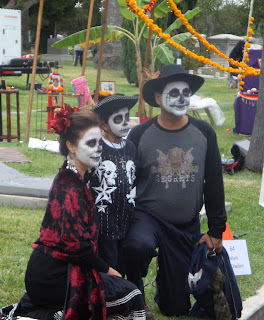 There is obviously a lot of effort behind this with the costumes and grave decorating...amazing!